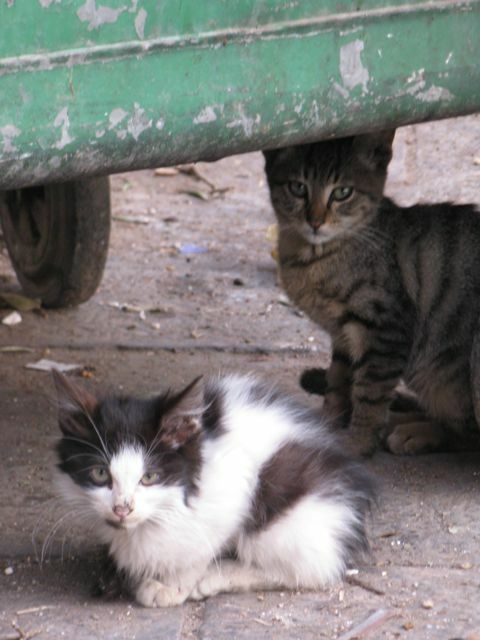 When this blog was about organic chemistry, I’d never stoop so low as to put cute pictures of cats on my website to drive traffic. Now that it’s all about cat science, I’ve lost any compunctions I might have had earlier. Want gratuitous cat pictures? You bet. But this blog is really about breaking new ground in cat science and cat analysis. 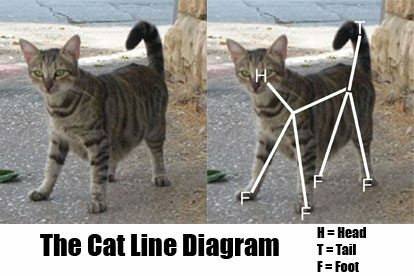 Today I want to study cat conformations in more detail and introduce a valuable tool that you can use for their further study and enjoyment: the Cat Line Diagram. See, if we want to analyze cats in general, we need to ignore all the extra details that make individual cats unique, like fur color, cuteness, girth – and instead focus on their common features. If we do that, we’d be left with a Cat Line Diagram. The advantage of the Cat Line Diagram is that it provides us with a means to take cats of different size, shape and age and analyze them. In this picture, for instance, you can see how these 4 different cats are drastically different but all share the same conformation as the cat in our first picture. Now there’s one complication with doing this. The picture above kind of shows how tricky it can get. Cats are 3-dimensional creatures and it’s difficult to show the 3-dimensional nature of cats on a 2-dimensional page. You can do anything with a Cat Line Diagram you can do with a normal cat, except you don’t run the risk of getting scratched. 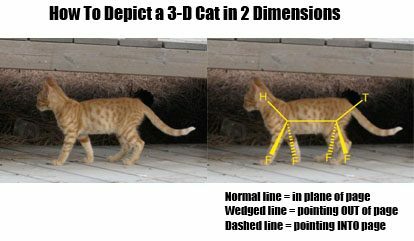 So just as Tabby Jr. in the picture below remains the same when we rotate him 180° in the plane of the page or along the the central axis, we can do the exact same things with a Cat Line Diagram. Note – we can only do this because this cat has a mirror plane (plane of symmetry) down the central axis. More on that later. Here’s the best part: what we’ve really done here is make an abstract model of a cat and now we can manipulate it as we wish. We can even go further and rotate the cat’s rear end another 30°, even without a picture to guide us. So In the picture below, this represents it lifting its rear leg up until it is completely level with the head. It takes a bit of time to see how these rotations work but if you’re really keen on studying this phenomenon you can pick up the skill rather quickly. My answer all of those skeptics out there who think that I’m basically using cats as an excuse to talk about concepts in organic chemistry – specifically, skeletal formulae – is the following: if you can’t see the difference here between molecules and cats, something’s seriously wrong with you. If they look the same, it’s just a coincidence. That would be awesome! let me know how it goes! This is brilliant! I never knew that cats were so interesting. Always blinded by the cuteness I guess. You could even add the ‘C’ in those diagrams. You know, for cat. Not like carbon at all. Later on I cheated and made it stand for “connector”. But it could also be collarbone or coccix. When “flipping” you are only flipping the images. If you were to rotate a real cat the foremost leg would move from the reader side of the image to the paper side. 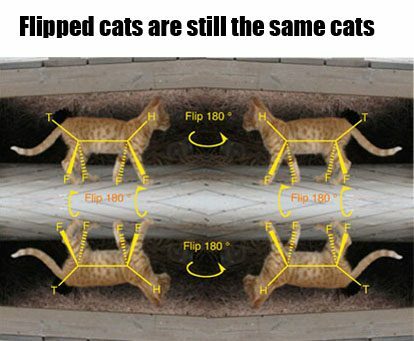 Your flipping only works because it’s just an image not a real cat. Unless you’re trying to show that the flip process involves changing the cat’s arrangement? 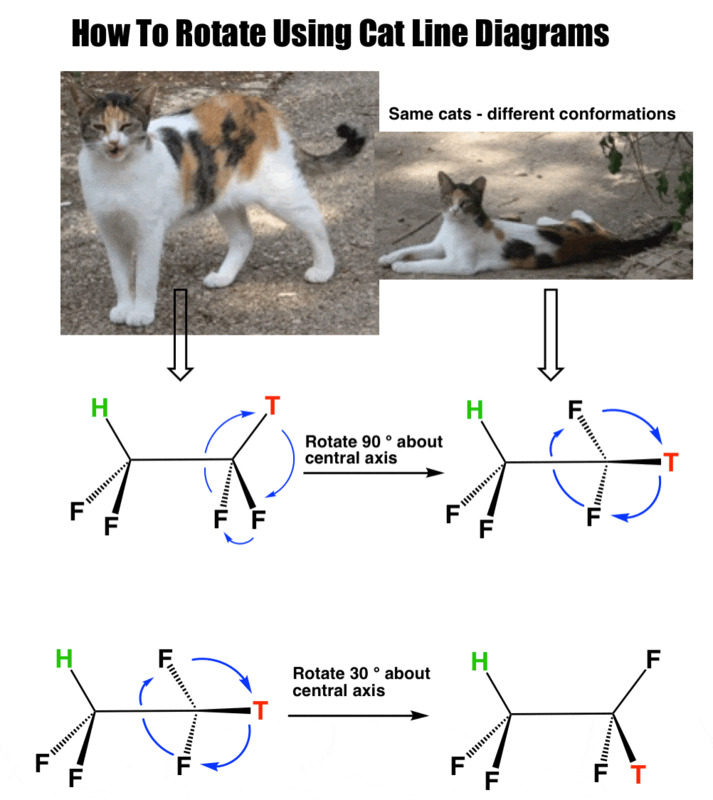 If Schrodinger can teach quantum with cats, why not Organic Chemistry too? 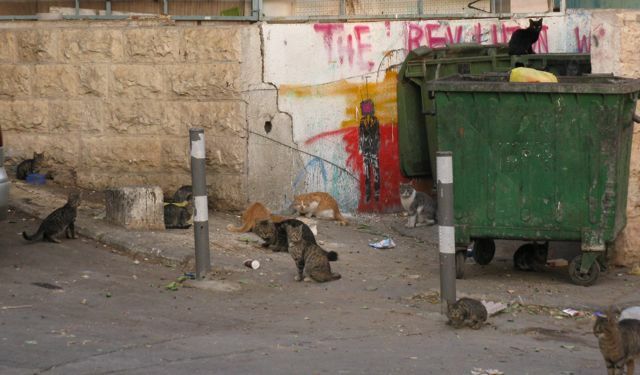 Yes – although I saw 3-legged cats in Jerusalem regrettably I did not get any pictures – otherwise I’d use your idea. I do have a picture of a 3-legged dog, but somehow that doesn’t seem appropriate. amazing. i like this concept(cat) very much. First time being on your website, and I’m dying of laughter…and learning! What a fabulous combination. This blog is brilliant! Of course it’s not about Orgo! It’s about the cute kitties! Awww! Being a cat lover and chemistry educator, I love this idea! So easy to introduce the 3-D reality in a 2-D drawing. You are right on the money James ! Were you high when you made this connection. So beautifully it fits and answers most of the concepts !! :) I should have stumbled on this blog in high school ! These blogs have really helped me understand all of the concepts being taught in my organic chemistry lecture this semester. Hearing it in lecture and seeing it written as a bunch of lines connected to a one-or-two letter abbreviation didn’t really make sense…but add in cute pictures of cats and I understand the concept immediately. THANK YOU! Its so much easier to understand than organic chemistry. I think I will abandon chemistry and just become a professional cat observer.